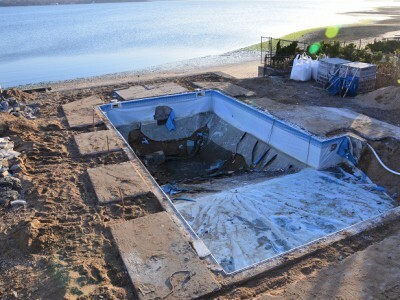 This 1970ish concrete wall, vinyl pool received a much needed updating! Upon meeting with the clients for the first time and discussing the many options available, we opted for the complete make over. 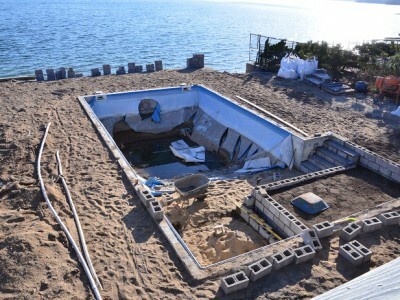 The biggest determining factor was the village, town and states unwilling to permit us to keep the renovated pool within the same distance to the bulk heading as the existing pool. 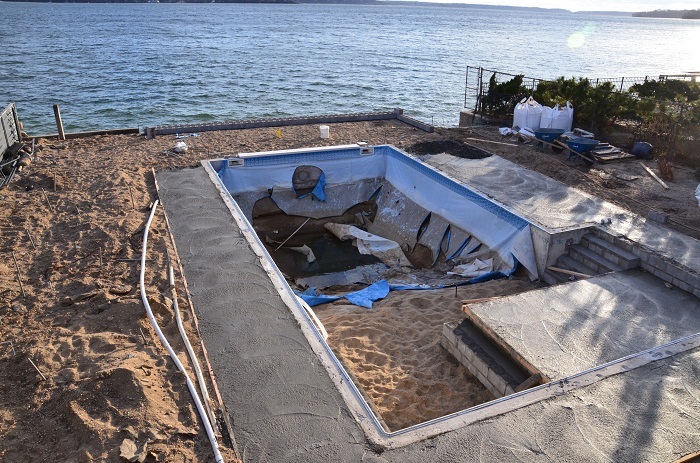 Instead, they made us shrink the pool’s overall size in half, and shift the new proposed pool closer to the house and further from the bulk heading. 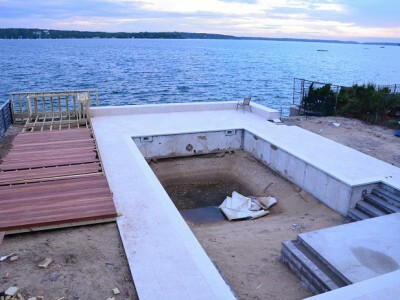 We started by removing all the patio, the fiberglass steps and rim lock coping, and fencing. 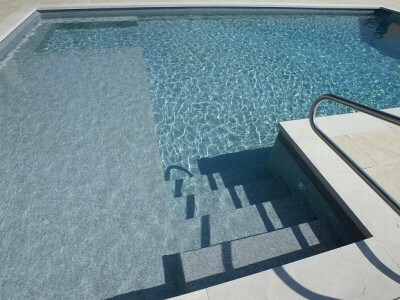 We then installed all new underground plumbing, manifold and in-wall fittings,we added three underwater led lights, updated the electrical system, added an automation system, a large sunning deck, steps and over 30 liner feet of bench made of concrete block and rya stone. 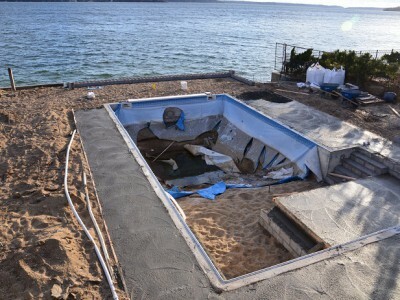 We added weep lines under the pool to handle the 4′ tidal water in and under the pool. We added all new liner tracking. 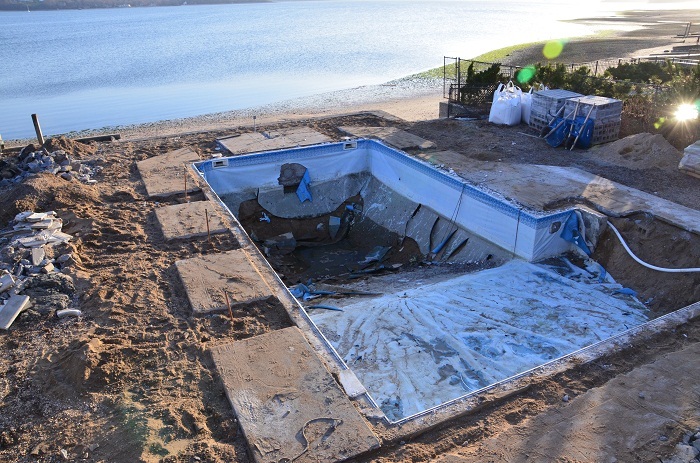 Once the ground water was under control, we installed the liner and filled the pool with water using tanker trucks. We poured all new sub slabs and slabs for the travertine patio, we used 24″ x 36″ travertine in a running bond pattern for all the patio spaces. 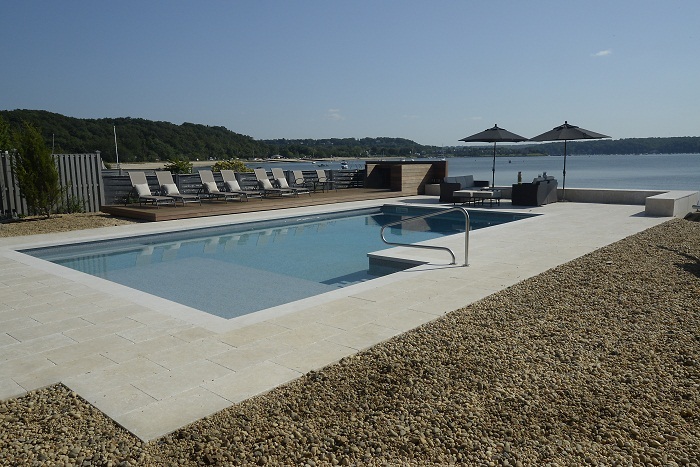 We built the concrete seating wall which is travertine covered on top of the bulk heading in lieu of having to install a fence, so we could take full advantage of the views. Although the village, town and state would not allow us to increase the masonry patio spaces, we did, however,find out, that the use of a raised wood deck could be used for additional seating space without have to be computed as land coverage. 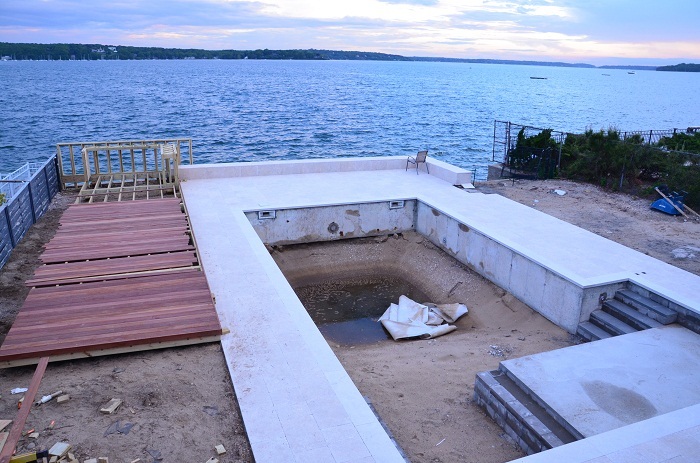 Not only did the wood deck provide the needed space for lounging, it also allowed the needed space for the raised water-side bar area. 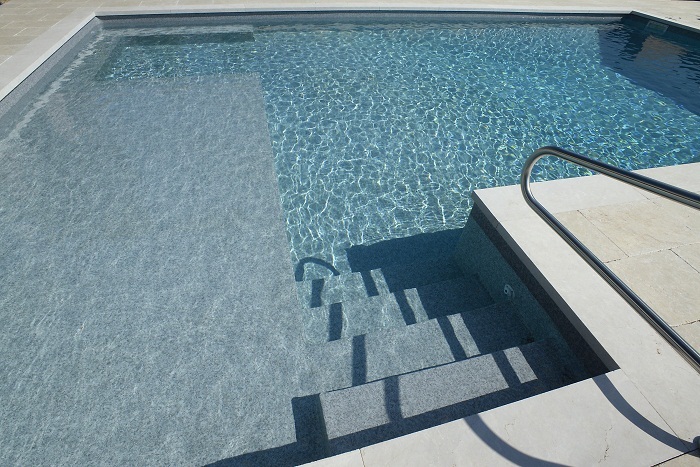 This project demonstrates how through great design, confidence in your team, and excellent communication between the contractor and client, an amazing project can be achieved! We have taken this one time great oasis, from its lost and forgotten years… Well into the next 40 years with pride and durability! 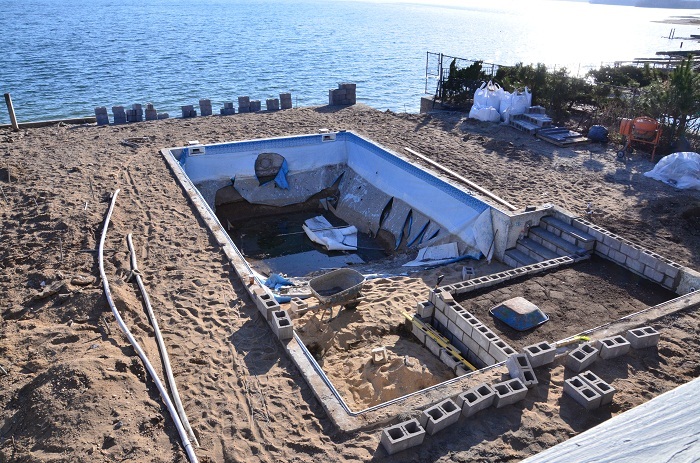 Once again, Swimming Pools By Jack Anthony is proud to announce we have won more awards then any other Long Island Swimming Pool company in 2016!